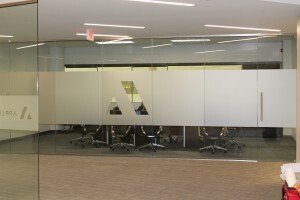 Applied Systems Rebrands with Lobby Sign and Interior Graphics! Acrylic lobby signs for University Park, IL, business have a huge impact on the way the reception area welcomes a client or customer. Case in point is Applied Systems. The insurance software giant has been in business for three decades. Constantly updating and upgrading its products and services, Applied Systems has succeeded with staying at the forefront of the cutting edge in technology and marketplace changes. With an office located at 200 Applied Parkway, it mattered to the management to maintain an appearance that is in harmony with the company’s industry leadership. With such strong leadership, it was time for this company to rebrand with a lobby sign and interior graphics. After contacting Mark Your Space’s knowledgeable lobby signage consultants, we discussed a rebranding opportunity with the management team. In the course of 30 years, the original logo and lobby sign setup needed just a bit of sprucing up. We created a blue acrylic logo rendition and a matching black typography setup that spells out the name of the company. We also added frosted conference room graphics. For University Park, IL, this is a much sought-after means of visually separating the room from the rest of the office space via the window panes. 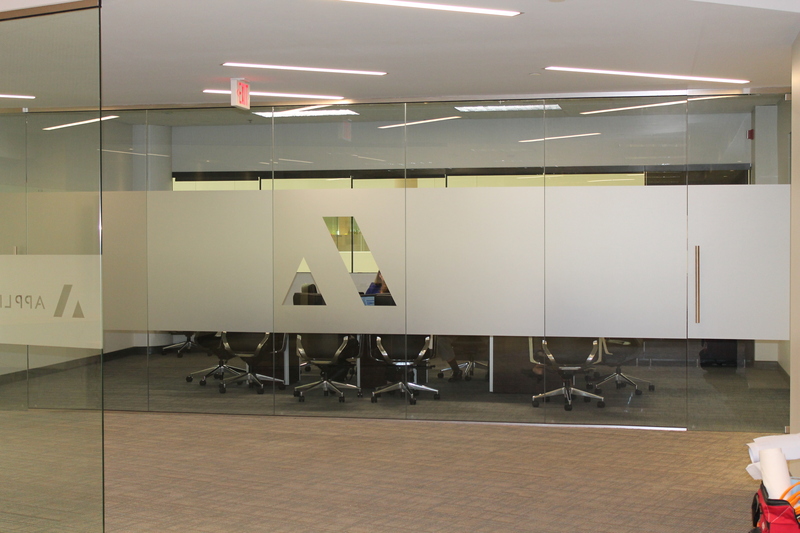 By strategically positioning a wide band of frosted vinyl across the glass, it also allows meeting participants to focus on the ongoing discussion rather than being distracted by the busyness of the office. 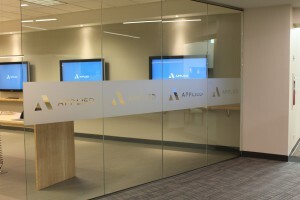 Applied Systems also decided to add definition to its space by adding vinyl graphics that mimic etched glass to the panes that separate the building’s general area from its suite. Interior etched glass vinyl graphics for University Park, IL, service businesses but also retail operations are common sights. This look gives the glass panels a bit of personality while separating the space from surrounding areas and doing a good bit of branding and marketing in the process. Are you thinking of rebranding your business? There are two good reasons to think about it now. Get in tune with today’s market climate. Just like Applied Systems had a look that was in place for 30 years, your company’s public face may have aged a bit over the course of the years or decades. By capitalizing on today’s market dynamics, you can gain – or regain – your position on the cutting edge of the industry. Sometimes it is little more than a small tweak to a color scheme or type font. Respond to demographic changes. Your current customers are not the same to whom you appealed a few years ago. A new generation has replaced them. Do you appeal to their modern tastes? A signage overhaul is a natural outcropping of your rebranding efforts. Remember to include interior as well as exterior markers. Moreover, use this opportunity to upgrade the look of your office a little bit. If the interior shows every one of its 20 or 30 years, a little overhaul is much needed. When you have plenty of glass panes to work with, frosted or other decorative forms of vinyl work wonders at a budget-friendly price. Talk to our signage experts today to discuss your rebranding ideas and upgrade needs. There is sure to be a product that will suit your needs perfectly! 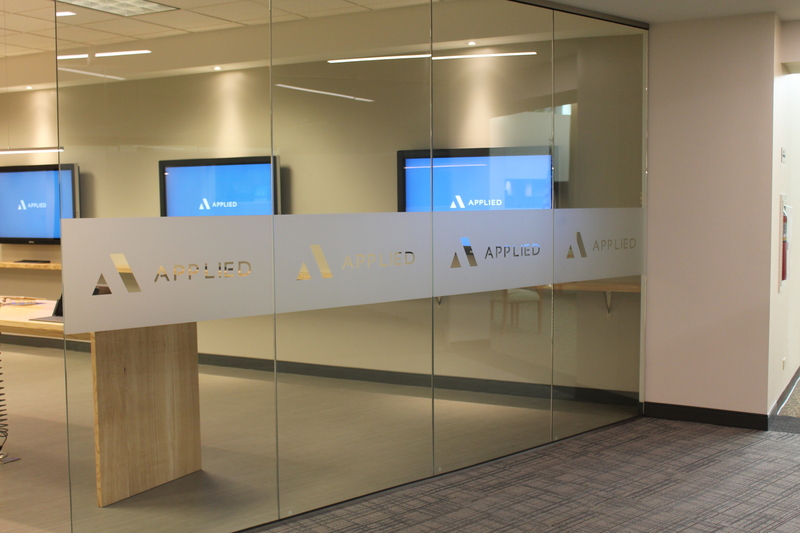 Title: Applied Systems Rebrands with Lobby Sign and Interior Graphics!